GARDEN VALLEY, IDAHO — Every winter deer and elk congregate on their winter range along the South Fork of the Payette River, and on a drive along the Banks-Lowman Highway they are often pretty easy to spot. "This is called the Wildlife Scenic Byway, you know for a reason," said life-long Garden Valley resident Alan Ward. Ward has spent all of his 61 years in Garden Valley. To him seeing wild animals is every day, but he still loves it when visitors or newcomers have a first-time encounter. "They'll just simply say 'you know, I just left the post office, and there were four elk running down the side of the road'," said Ward. "And they say 'I have just never seen anything like that before.' I'm like yeah, it's neat." Ward owns the Garden Valley Motel, so for him the elk are not only an enjoyable part of the scenery, they are also a draw for his business, especially during winter. Fish and Game Conservation Officer Corey Taylor also loves the wildlife, but in his world the animals create work. 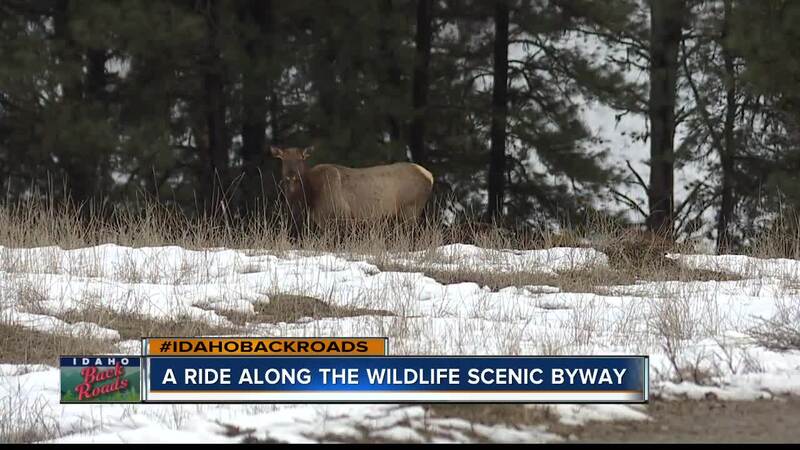 "Every year, I have probably a half dozen or more elk either killed or injured due to traffic collisions," said Taylor. Last year people reported eighty deer and elk killed on roads throughout Boise County, but Taylor says there are many that go unreported every year. He says those numbers could drop if people would slow down, and stay off their cell phones, especially at dawn and dusk. Fish and Game also asks homeowners not to draw elk into subdivisions by putting out feed. Feeding wild animals is not illegal, but especially during mild winters like this one, the herds have plenty of natural forage, which keeps them healthy and less exposed to traffic. "And try to get your vehicle completely off the road before you jump out and take pictures or view the wildlife," said Taylor. "Otherwise you become another hazard to others on the highway." Or you can do what many of Alan's guests do.